This year’s Grassland & Muck Event – being held May 24th and 25th at Stoneleigh, Warwickshire – will see the UK launch of the JCB Loadall 536-60 AGRI Pro telescopic handler. Featuring the all-new JCB DualTech VT transmission providing the best characteristics of hydrostatic and powershift drives, the 536-60 AGRI Pro weighs about a tonne less than the equivalent 7m Loadall introduced last year but still has a lift capacity of 3,600kg to a full height of 6.2m. It will typically be used by larger dairy and other livestock farms, where the low-speed control and fast cycle times provided by the DualTech VT transmission are ideal for the daily feeding routine and other year-round tasks. 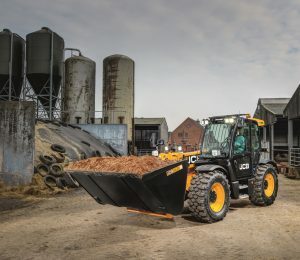 The new Agri Pro model also features JCB’s advanced Smart Technology hydraulics with automated bucket rattle and fast but controlled boom operation for rapid fuel-saving loading cycles, JCB LiveLink telematics to provide security functions, service monitoring and early warning of potential faults, and data that can help owners and operators manage their JCB machines to the optimum. In addition, the 536-60 AGRI Pro has a premium specification cab and controls, JCB’s Smooth Ride Suspension for the boom as standard, and a 4.8-litre, 145hp version of the fuel-efficient JCB EcoMAX diesel engine. This has a compact ‘one-can’ SCR + DOC emissions control package housed beneath the engine hood with no detrimental effect on all-round visibility or service access.